Kiowa County won't quite make it to the first 100 degree day of the season - but it might feel like it. An upper level ridge will be in place across the region Friday keeping the area dry, though higher elevations may see some showers. Mid- to upper 90s will be the rule for the weekend, starting with Friday's expected high of 98, followed by 95 and 93 for Saturday and Sunday. Overnight temperatures will be in the 60s through Sunday. A slight chance of showers and thunderstorms arrives Saturday after 4:00 p.m. and continues for a few hours. A somewhat greater chance returns early Sunday afternoon and remains into the night. Expect less than one-tenth inch of precipitation where showers do occur, and higher amounts with thunderstorms. Southeast winds in the 5-15 mile-per-hour range are expected starting Friday afternoon and remaining throughout the weekend. 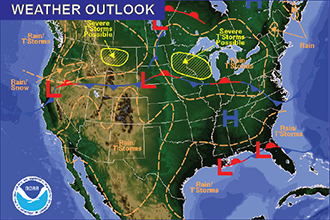 Looking to the week ahead, a trough moves over Colorado Monday and Tuesday, bringing with it additional risk of thunderstorms, though the location for the best moisture is still in question. A ridge builds over the area Wednesday and Thursday, starting a warming and drying trend. Most of the week will continue to see temperatures in the 90s, however Tuesday will only reach to the mid 80s.